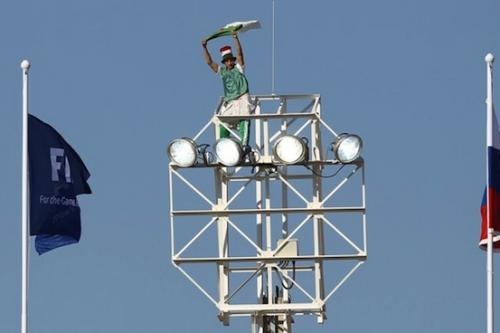 A crazy Algerian fan is seen at the top of a lightpole during the Algeria Slovenia game. This drew the attention of South African riot police. The early game of Algeria-Slovenia was arguably more boring than the France-Uruguay game this morning, but at least there was a fan who decided to entertain the viewers by climbing up the lightpole of Peter Mokaba stadium. 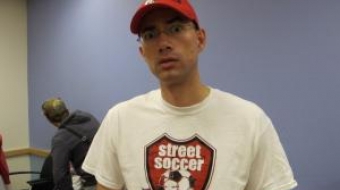 The only goal came via another goalkeeping mistake by Algerian Keeper Fawzi Chouachi when Slovenian Captain Robert Koren's weak attempt on goal squirted by him. This howler was not as bad as Robert Green's a day earlier but had even worse repercussions. There was nothing in this game until Algerian Striker Abdelkader Ghezzal handled the ball in Slovenia's penalty box giving the referee no choice but to give Ghezzal a second yellow card and an early trip to the showers. Slovenia was not impressive attack-wise, but never really gave Algeria any chances during the game. The next game was also a snoozefest Ghana and Serbia seemed totally complacent with a 0-0 tie, until Serbian Alexander Lukovic was sent off for a second bookable offence in the 74th minute. This seemed to inspire the Serbs for a bit. But disaster struck for Serbia when in the 83th Zdravko Kuzmanovic handeled a cross into Serbia's penalty box. Asamoah Gyan stepped up and sent the Serbian goalkeeper the wrong way, and sent Ghana on their way to a victory with big implications in Group D.
The third and final game was more entertaning if you were a German fan, for Aussie fans it was depressing. The Germans got off to a dream start with a goal from Lukas Podolski. The Germans made it worse in the 26th minute when Miroslav Klose rose above Australian Goalkeeper Mark Schwarzer to nod in the 2nd goal. The game was ended in the 56th minute when Tim Cahill was unjustly shown a red card for a tackle from behind. The Germans added insult to injury with two goals late in the second half and sent a statement that they are going to be tough to beat. DS: Thomas Muller's 3-0 goal for Germany.